Saudi Arabia has been at war with Yemen long before its grand coalition of allies decided to unilaterally wage a vengeful military campaign against this poorest nation of Southern Arabia on March 25, 2015. Yemen’s misfortune began at the very moment its people rose a movement against institutionalized servitude, some decades ago in 1962. Little could Yemenis have suspected then that their claim for self-governance against the Imamate would prompt the kingdom to actively seek their enslavement. As Pan-Arabism rose a giant against monarchies in the Greater Middle East - a new political dawn on the back of the broken bones of imperialism, Saudi Arabia recognized in Yemen both the key and the cornerstone to its ambitious hegemonic future. 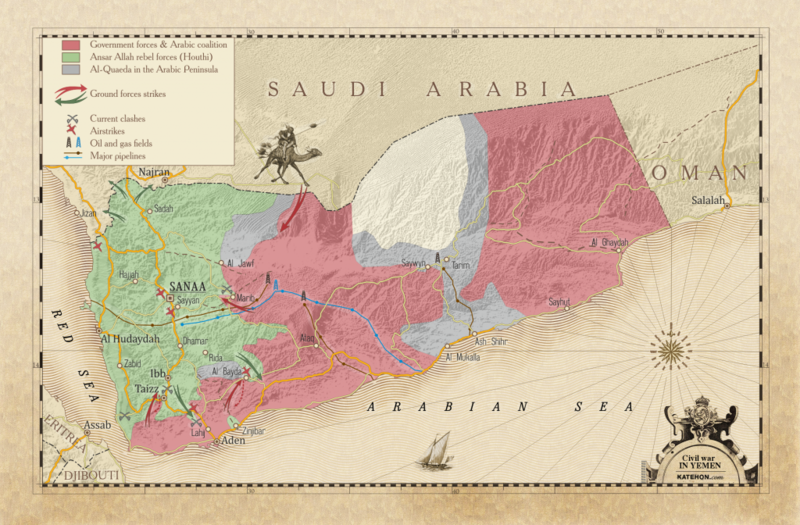 Symmetrically Yemen carried within the seeds of the kingdom’s destruction – a ticking geo-political bomb of sort. It is important to remember that if Yemen stands today a broken shell of a country, a petri dish for all things radicals, and a poster child for “failed state”, it is because Riyadh made it so. Yemen’s misfortune, its crippling poverty and diseased institutions are the products of decades of latent colonialism. If the kingdom was ever to reign all mighty over Arabia, unruly Yemen – this one geostrategic jewel – would have to be tamed to the crown of al-Saud. “The geopolitical importance of Yemen cannot be ignored. The country controls entry into the Red Sea (towards the Suez Canal) and the Bab-el-Mandeb strait, which although less important than the Strait of Hormuz, is the point of passage for oil and gas on its way to Europe,” wrote Alain Gresh in April 2015 in a report published for The New Arab. In this bitter battle for hegemonic control Yemen has been a lamb brought to the slaughter, a playground for a newly evolved form of asymmetrical imperialism – one which has relied on proxies to carry its will, while muddying the political waters to hide its hand: control, through the establishment of an energy monopoly. Saudi Arabia’s agenda in Yemen is simple in that it is absolutely egocentric! Saudi Arabia needs Yemen if it is to ever achieve control: socio-political control, control over natural resources, geo-military control, economic control, and of course religious superiority. Riyadh’ success remains dependent on its ability to bring Yemen to heel and kneel. Understand this and everything else will more or less fall into place. The only agenda the kingdom EVER had in Yemen was a colonial one, an imperial one. Yemen was never meant as a buoyant democracy … And while Yemen did in fact manage to reinvent itself a republic among a sea of absolutist monarchies, its institutions were so severely infiltrated, and set up for both political and economic feudality, that its republican claims were but an institutional mirage hiding behind the reality of tribalism. Yemen’s present lies in the understanding of its past, and those dynamics which were set in motion long ago. With a symmetry which does not lack a certain poetry, it appears that Yemen’s true liberation from the shackles of feudalism – as expressed by Saudi Arabia imperialism, would come by way of the Houthis – a tribe of northern Yemen which history in link to the Imamate. Hailing from northern Sa’ada in Yemen Highlands, the Houthis are first and foremost a tribal faction which loyalty remains forever attached to al-Houthi clan, the custodian of a religious heritage few have been able to comprehend, let alone encompass. Sheikh Abdel-Malek al-Houthi stands not a mere tribal leader over his tribesmen, he is northern Yemen’s religious leader, and he is together Yemen’s past and its future – a bridge in between traditions and a desire to rise state institutions rooted in popular legitimacy. And though many have seen Sheikh al-Houthi an ambitious leader in search of a fief, it needs to understood that his ambitions lie far beyond the political. His house stands above the political fray, the Custodian of an Islamic religious tradition which stretches back to the birth of Islam. While I will circle back to this through my writings I would like to make clear that the weight of the religious in Yemen’s history is of utmost importance. And I am not just referring to Wahhabism – or as mainstream media like to call it: Islamic radicalism. If there is a war being waged against Yemen and its people, there is another more insidious which has bene waged against its religious identity: Zaidism. Because Zaidism, like all other expressions of Shia Islam essentially, and absolutely stand in rejection of any, and all form of absolutism, Wahhabist Saudi Arabia has worked, ambitioned and plotted to lay it waste. Behind the glitz and political glam the kingdom has so diligently projected onto the world hides an agenda which should send shivers down your spine. Should Yemen fall, Riyadh would rise a titan over the world oil route, wielding energy security in the face of the stealthiest of military power. Bearing in mind that it was Saudi Arabia which inspired the rise of Terror, through the promotion of Takfirism – the foundation of Wahhabism, I would argue that world powers need stand with Yemen’s Resistance, and not the kingdom. If not out of respect for its popular will, at least out of sense of preservation. It is now 1918 and the formerly grand and powerful Ottoman Empire is breathing its last. As inner tensions and wars have eroded the empire the Ottomans withdrew from Yemen – a territory which had proven unbending and unyielding to the will of the Sultan. Although an Ottoman colony on paper, Yemen was never exactly a loyal vassal … a reality the Ottomans had learnt to contend with for the sake of geopolitical supremacy. Since Yemen could not be conquered the Ottomans entered into an alliance with the Imams of Yemen, thus ensuring that Arabia would be contained away from the influence of another super-power: Persia (modern day Iran). As WW1 ended, Yemen witnessed the departure of the Ottomans. Free from foreign diktat, Imam Yahya took control of the country (northern Yemen). He would remain as Imam of Yemen (king) until his death in 1948. During his rule, Yemen joined the Arab League (1945) and the United Nations (1947). Imam Yahya’s rule was fraught with political opposition – his reign would end in blood as he was assassinated in a failed coup attempt against his Imamate. It is his son Ahmad, who took over until his death in 1962. Imam Ahmad’s rule would be one of repression, and violent oppression – the desperate attempt of a reigning house to grab hold of power despite thinning popular support, and legitimacy. As we delve into Yemen’s political history it is important to remember that no governing system can ever truly hold if not rooted in popular support. Whether a republic, or a monarchy, no political system can be sustained without a degree of compliance. Ahmad's rule became known for its totalitarianism, tension with the British over their presence in south Yemen, and pressure to support the Arab nationalist regime of Egyptian President Gamal Abdul Nasser. The United Arab Republic (Egypt) had had a special relationship with Yemen in the past. In March 1958, Yemen joined it to form the United Arab States, but this association was dissolved in December 1961, shortly after Syria seceded from the United Arab Republic. Interestingly much of today’s issues: territorial, and geo-political can be traced back to pre-Republic Yemen, at a time when imperialism was still openly flaunted as a political norm. Even then the seaport of Aden was a point of contentious, with the Imam of Yemen arguing the city was legally part of its territory, and should therefore be returned to his dominion. A claim the British were only too keen to deny due to the geo-strategic advantage and commercial vantage point the seaport offered the Empire. On 19 September 1962, Imam Ahmed bin Yahya died and was succeeded by his son, Imam Mohammed al-Badr. A week later, a rebellion of revolutionary forces led by the army overthrew the new Imam and proclaimed the Yemen Arab Republic. Following his overthrow, Imam al-Badr managed to escape from Sana'a, the capital, and, with other members of the royal family, rallied the tribes in the northern part of the country. With financial and material support from external sources, the royalists fought a fierce guerrilla campaign against the republican forces. The revolutionary Government accused Saudi Arabia of harbouring and encouraging Yemeni royalists, and threatened to carry the war into Saudi Arabian territory. Riyadh’s meddling in Yemen’s affairs had begun … The horrors and bloodshed Yemen has been put through serves a testament to a long overdrawn race for control – a pursuit which has grown exponentially across the decades, acting a mirror to Yemen’s intrinsic geostrategic worth. If Yemen is poor, unruly, and grossly under-developed that it is not to say that its lands do not hide immense potential. Many experts, among whom Marwa Osman, Director of Veritas Consulting and Lecturer at LIU University in Lebanon, would argue that Yemen’s failure to launch was engineered to keep it under tight Saudi patronage. “Yemen stands a victim in a race for power the public still remains unaware of. If a monarchichal Yemen fitted within al-Saud plans for grandeur, in that it would have not offered any form of political challenge to the House of Saud, a free and independent Yemen was never going to be tolerated … especially one which could have followed in the footsteps of the Islamic Revolution,” Osman said in an interview. The role of Iran’s Islamic revolution here is not to be understood from a religious standpoint, but from one of popular emancipation, and resistance against imperialism. While Iran reinvented its institutions on the basis of Shia Islam, its core values are universally shared: social-justice, equality before the rule of law, popular sovereignty, civil liberties and human rights. Labelled an institutional chimera on account its rise caused imperialists many upsets, Iran’s Islamic Republic was never offered the courtesy of the truth … but I will get to that later on. Should Yemen had been allowed to reach full economic and political maturity, Saudi Arabia would have likely been eclipsed as THE regional superpower. There is more to Yemen than meets the eye … But back to Imam al-Badr! Faced with the loss of his kingdom, the Imam slammed Egypt for its “betrayal”, accusing President Nasser of fomenting a grand plot of destabilization. Egypt denied the charge. Still, at the beginning of October, large numbers of United Arab Republic forces were dispatched to Yemen at the request of the revolutionary Government to assist the republican forces in their fight against the royalists. Whether or not Egypt did in fact planned al-Badr’s deposition to open a new Pan-Arab front at the heart of Arabia, Cairo nevertheless ended up supporting Yemen’s revolutionaries against what it saw as an impediment to Arabs’ emancipation from imperialism, and covert colonialism. The new Government was recognized by the United Arab Republic on 29 September and by the Soviet Union the next day, but other major Powers with interests in the area, including the United Kingdom and the United States, withheld action on the question of recognition. The revolution was supported by Egypt who supplied troops and supplies, while al-Badr was supported by Saudi Arabia and Jordan. The newly emergent forces representing republicanism and social progress were concentrated in the major cities, while the monarchist, reactionary, and theocratic royalists launched a successful counterrevolution from the countryside with the support of the rural population. The proximate cause of the conflict was the arrival of U.A.R. Egyptian troops in Yemen to support a palace coup by republican revolutionists on the night of 26 September 1962. Saudi Arabia, fearing the revolutionary upsurge on its borders, reacted by sending supplies and money to the pro-royalist forces behind the deposed Imam Muhammad al-Badr, who led the royalist counter-revolutionists. From the republican standpoint, Saudi assistance (never in the form of troops) constituted interference in the affairs of the Yemen. From the Saudi standpoint, the U.A.R. military presence on the Arabian Peninsula constituted a threat to its monarchy and its oil fields. The belief was that the U.A.R. sought to extend the Yemeni revolution to all of southern Arabia and bring about the collapse of the Federation of South Arabia, as it was then called. In the early months of 1963, the conflict was intensified on all fronts. The total Egyptian forces rose from 12,000 to an estimated 28,000, with a sharp increase of Russian and Soviet bloc personnel. While the U.A.R. started to withdraw its forces in the early days of May 1963, the ships and planes that ferried troops to Egypt invariably returned with replacements in systematic rotation. Consequently, there was no net reduction of Egyptian forces in the Yemen, nor did Saudi Arabia fully terminate its aid to the royalists. The British government endeavoured, not wholly successfully, to discourage Aden-based operations in support of the Yemeni royalists. The British mercenaries fighting with the royalists were "a private enterprise." The presence of an Imam in Yemen was essential to both the Zaidis and Shafeis. In the absence of an Imam as temporal-spiritual head of Yemen, by early 1964 the people were staying away from Friday prayers. While the Imam did not have to be drawn from the Hamid aL-Din family, no other family qualified for the position had sufficient stature or the appropriate personality. The British Government was "not necessarily anxious" to restore the Imamate, believing that the Yemeni consensus might favor such a development. Interesting how time can change alliances but never ambitions. It is the Houthis, the heirs many have argued of the Imamate, who today have been labelled the designated enemies, while President Abdo Rabbo Mansour Hadi, and his loyalists have been portrayed as the carrier of institutional legitimacy. While roles might appear reversed, a closer look actually reveal how very symmetrical today’s war is from 1962. In an 01 April 1964 letter to the President of the UN Security Council Yemen charged that the United Kingdom had committed more than 40 acts of aggression against it since September 1962, culminating in the air attack against Harib on March 28. A British letter of March 28 stated that the attack had been launched to protect the South Arabian Federation after a series of Yemeni air and ground attacks during the month of March. The Security Council convened on April 2 to consider the charges and counter-charges. The United Nations Yemen Observation Mission UNYOM (July 1963-September 1964) was established in July 1963 to observe and certify the implementation of the disengagement agreement between Saudi Arabia and the United Arab Republic. The tasks of UNYOM were limited strictly to observing, certifying and reporting in connection with the intention of Saudi Arabia to end activities in support of the royalists in Yemen and the intention of Egypt to withdraw its troops from that country. In his report dated 3 May 1964, the Secretary-General stated that there was no progress in troop reduction towards the implementation of the disengagement agreement and that no actual end of the fighting appeared to be in sight. The mandate of UNYOM ended on 4 September 1964 and its personnel and equipment were withdrawn. There had been a substantial reduction in the strength of the Egyptian forces in Yemen but it seemed that the withdrawal was a reflection of the improvement in the situation of the Yemeni republican forces rather than the beginning of a phased withdrawal in the sense of the agreement. There were also indications that the Yemeni royalists had continued to receive military supplies from external sources. Egyptian efforts to defeat the royalist forces and destroy their civilian support bases proved particularly difficult in the mountainous terrain of northern Yemen. Frustrated by the successful royalist guerrilla tactics, Egypt employed chemical weapons they had developed in the 1950s and obtained from the Soviet Union; defensive equipment was also obtained from the Soviets. Egypt was the first Arab state to use chemical weapons. Despite having signed the 1925 Geneva Convention, which outlawed the use of chemical weapons, Egypt employed chloroacetophenone tear gas, mustard blistering gas, phosgene, and nerve agents repeatedly from 1963 to 1967. Egypt denied ever using chemical warfare during its support of the new republican forces, but early accounts and evidence of chemical warfare came from journalists in the area. On June 8, 1963, Soviet-made Egyptian air force airplanes dropped chloroacetophenone tear gas bombs on numerous royalist villages south of Sa’ada, near Saudi Arabia. Egypt allegedly used the bombs to terrorize or kill not only the village inhabitants but also the royalists hiding in caves and tunnels. A cease-fire took effect 16 September 1964. The Soviets impressed upon Nasser the need to come to terms with King Faisal, given the Soviet desire to avoid strengthening the U.S. position in Saudi Arabia. In the face of an increased danger of armed uprising in Egypt, immediate relief from the Yemen problem appeared necessary. To the Russians, preservation of the existing U.A.R. regime was a pressing matter in light of their decline in Iraq and Syria. If for their own sake alone they had to save Nasser and the Yemen, peace was the first step. Under the terms of the cease fire, withdrawal of U.A.R military forces were to begin as of 23 November 1965 and be completed by 23 September 1966. The result was a shattering military and diplomatic setback to the U.A.R. Throughout this continued military and political stalemate, the split between the pro-Egyptian and moderate republicans had widened and intensified. The revolutionary republican forces split into opposing factions over the issue of Egyptian support. This dispute led to the ouster of the ruling junta in 1966 and its replacement by a pro-Egypt regime. The change of government was followed by a sweeping and bloody purge of the Yemeni armed forces and the administration. In January 1967 a poison gas attack occurred on the Yemeni village of Kitaf. This was the first use of nerve agents in combat. During this air raid, bombs were dropped upwind of the town and produced a gray-green cloud that drifted over the village. According to newspaper accounts, 95% of the population up to 2 km downwind of the impact site died within 10 to 50 minutes of the attack. All the animals in the area also died. The estimated total human casualties numbered more than 200. Another reported attack took place on the town of Gahar in May 1967, killing 75 inhabitants. Additional attacks occurred that same month on the villages of Gabas, Hofal, Gadr, and Gadafa, killing over 243 occupants. In addition, two villages in Saudi Arabia near the Yemen border were bombed with chemical weapons. The Yemen conflict reached its decisive turning point with the outbreak of war between Israel and the U.A.R. on 5 June 1967. Egypt was reported to have withdrawn 15,000 men, 150 tanks, and all its heavy artillery from the Yemen during the week of 5-12 June. Estimates of the number of Egyptian troops in Yemen before this withdrawal varied between 40,000 and 70,000. The conflict lasted until 1967 when Egyptian forces withdrew, Saudi aid to the royalists was halted, and the opposing leaders reached an agreement. The withdrawal was supervised by Morocco, Iraq, and the Sudan and was completed on 15 December 1967. The arrangement was vigorously denounced by President Salal, who shortly thereafter was ousted in a republican coup. The new state was called the Yemen Arab Republic, and Saudi Arabia recognized the new republic. Subsequently the Soviet Union carried out a massive emergency military airlift to the Yemen, including for the first time the use of Soviet Air Force pilots for combat missions. The effect of this has been to deny a royalist victory and motivate Saudi Arabia's resumption of military aid to the royalist tribesmen. The Yemen appeared attractive to Soviet plans because of its location on the Red Sea opposite east Africa, about a thousand miles south of Cairo. The Soviet construction of a modern jet airport for the Yemen was viewed by the U.S. with natural concern, for the USSR could use it to develop access to east Africa, improve air connections with India, and open shorter routes across Africa to Latin America. The U.S. and Great Britain were in fundamental disagreement as to the scope and nature of the problem. Yemen civil war officially ended with the Compromise of 1970, a political agreement between the republican and royalist factions. A republican government was formed in Yemen, incorporating members from the royalist faction but not the royal family. Then began a covert colonial campaign against the budding Republic. Since Yemen was not broken through war, Saudi Arabia reverted to a more insidious form of control – utilizing engineered chaos to better rise a master over Arabia. Wahhabism in this equation would come to claim its pound of flesh. Now that I have offered some historical context to Yemen’s war, let me introduce you to Yemen’s who’s who – a lay of the land if you will.